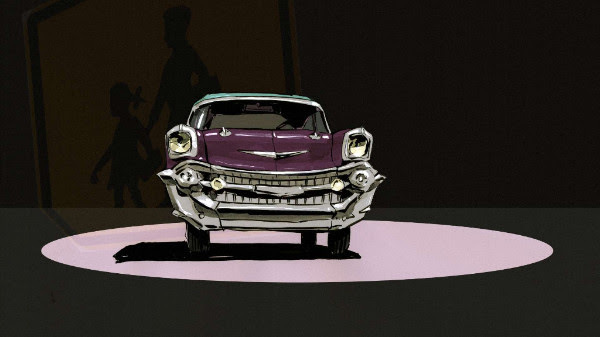 Carface (Autos Portraits) by Claude Cloutier, a short produced by Julie Roy for the National Film Board of Canada (NFB), won the Prix Guy-L.-Coté Best Canadian Animation Film at the 2015 Sommets du cinéma d’animation earlier this evening. The Festival ran from November 25 to 29 in Montreal. The film has made the shortlist of 10 works in consideration for the Academy Award® for Best Animated Short Film, along with another NFB production, Cordell Barker’s If I Was God. The five nominees will be announced on January 14; see the Academy of Motion Picture Arts and Sciences press release for more details: http://www.oscars.org/news/10-animated-shorts-advance-2015-oscar-race. Carface is the seventh short film by Claude Cloutier, whose Sleeping Betty (2007) won a Genie, a Jutra, and more than 20 other awards around the world. It was the opening film of the Rendez-vous du cinéma québécois (RVCQ) and was in official competition at the prestigious Annecy Animation Film Festival as well as the Ottawa International Animation Festival. From filmmaker and cartoonist Claude Cloutier comes Carface, a scathing musical-comedy satire about the power of Big Oil, in which cars perform a song-and-dance number while the planet slides toward ruin. Produced by Julie Roy for the NFB. Running time: 5 min. Claude Cloutier first gained fame as a comic-book artist with the series La légende des Jean-Guy and Gilles la Jungle contre Méchant-Man. He went on to make several animated films, including The Persistent Peddler (1988; in competition at Cannes), Overdose (1994), From the Big Bang to Tuesday Morning (2000), Sleeping Betty (2007; some 20 awards), The Trenches (2010), Interférence (2014) and Carface (2015). Tagged 2d Animation, 2D Animator, National Film Board of Canada, NFB.